I believe that everyone will agree with me if I say that we humans are extremely lazy sometimes. We all have a little sloth living in our body that restrain us from doing too much movements, specifically when we just want to relax, for e.g., when we are on a flight. Boeing accepts the fact that passengers want their flight time to be more relaxing and hassle-free. That’s exactly what the Boeing is up to. Boeing aircraft usually provides infotainment systems for you to watch a movie, listen to music, or feel the wind in your hair by controlling the fan speed (for e.g. by pressing buttons in front or top of your seat). But in order to be more intuitive, Boeing has come up with a patented technology which allows you to control anything with gestures, i.e. without touching/tapping a button or a screen (which may be far from a passenger’s reach). Gestures for controlling things are fun, can even give you a feeling of Harry Potter sometimes. Boeing aircraft includes a passenger service unit (unit 24, as shown in figure 2) comprising of components such as a reading light, an attendance call button or an air vent etc. for the passenger, which can be controlled by using hand gestures. 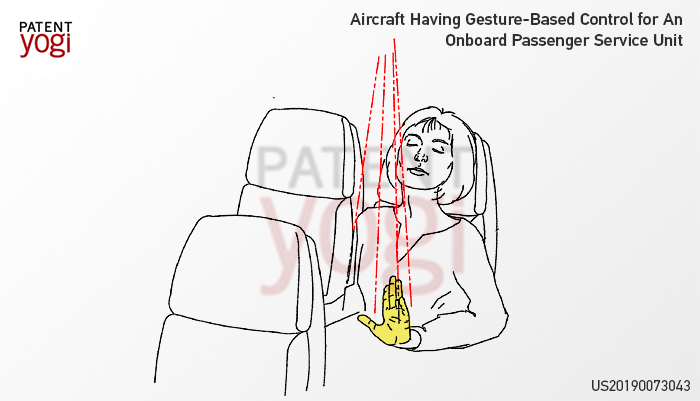 Further, Boeing aircraft include a number of sensors that can capture hand gestures associated with the passenger. For example, the aircraft includes a camera (camera 36, as shown in figure 2) on top of every seat capturing image data associated with the passenger. Further, the camera is communicatively coupled with a control module. 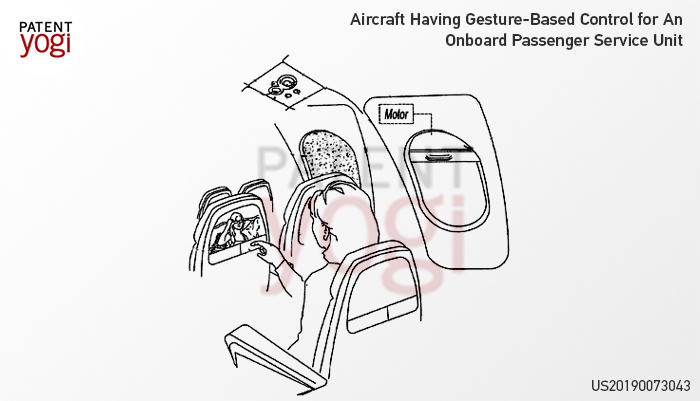 The control module receives images of passenger and hand gestures, which is analyzed and a gesture data is generated by correlating the hand gesture and images. Further, the gesture data act as an actuating signal for one or more cabin system to control components such as reading light (e.g. turning the light on or off), attendant call button or air vent of the passenger service unit. Different gestures can be used to control different components. For example, you can make a gesture for turning a knob in a clockwise direction to increase a fan speed of the air vent (or counter-clockwise direction to decrease the fan speed). Moreover, an in-flight entertainment (IFE) system (such as IFE 26, as shown in figure 2) provides a user interface allowing you to set unique gestures (as per your desire) for controlling different components. For example, you can set a gesture (e.g. swiping your hand up) in order to open (or close) a side window without disrupting surrounding passengers, which improves the overall passenger experience.